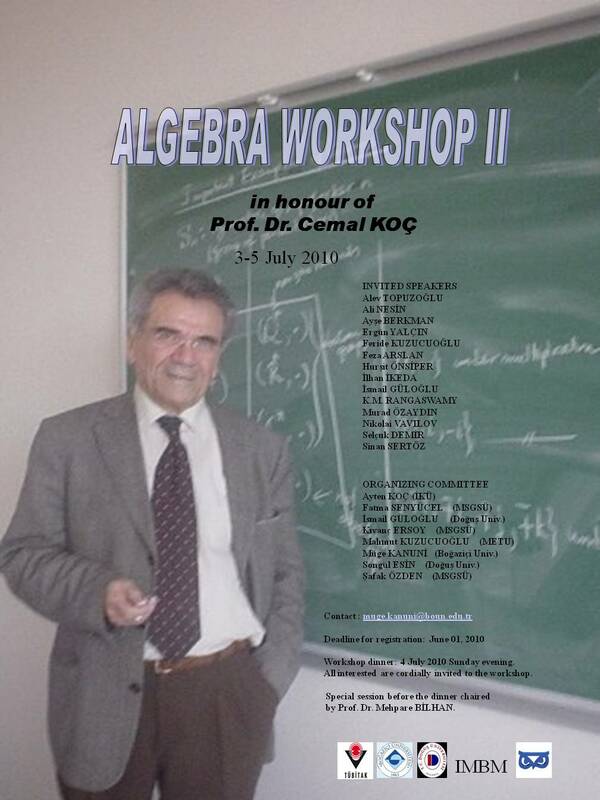 Algebra Workshop II in Honour of Prof. Dr. Cemal KOÇ will be held in İstanbul Boğaziçi and Mimar Sinan Fine Arts Universities on 03 - 05 July, 2010. The first and the last days of the workshop will be held at IMBM located at the South campus of Boğaziçi University. The second day of the workshop will be held at the Fındıklı campus of Mimar Sinan University. There will be a workshop dinner, following the second day talks at the Fındıklı campus of Mimar Sinan University. Before the workshop dinner, there will be a special session to share our memories about Prof. Dr. Cemal Koç. We would like to see friends and colleagues of Prof. Koç among the attendees of the conference. The chair of the special session will be Prof. Dr. Mehpare Bilhan. If you cannot attend the workshop, however are willing to attend the special session and workshop dinner on Sunday 4, July 2010 evening, please send an e-mail to muge.kanuni@boun.edu.tr by 01 June 2010.